The 1877 Indian Head Cent is considered to be the classic key date of the series, which was introduced in 1859 and struck in considerable numbers until the early 20th century. The Indian Head cent design by James Barton Longacre would become one of the most enduring coin designs of its era. Miss Liberty is depicted wearing a Native American headdress on the obverse . Longacre’s design featured Miss Liberty wearing a Native American head dress on the obverse, and a wreath on the reverse, initially of laurel leaves and subsequently with oak leaves and a shield at the top. Circulation was relatively widespread for the first few years following the introduction of the series, but the American Civil War changed this. Similar to other denominations struck in gold and silver, all copper nickel and bronze Indian Head Cents were hoarded despite the continuing production at the mint in Philadelphia. After the Civil War concluded, the cents returned to commerce. However, because of the legal tender limit of four cents, authorized in the mid 1860’s, there was a legal reason to refuse cents in large quantities. The Mint Act of 1871 authorized the Mint to redeem the cents, both copper-nickel and bronze, melt them, and reissue them. This occurred in relative large quantities in the early 1870s. In 1874, it was decided at the Mint that most of the redeemed bronze cents could easily be reissued, without the necessity to melt the pieces. It was this decision that would eventually lead to the scarcity of the 1877 Indian Head Cent, only a few years later. Almost ten million bronze cents were redeemed that year, and virtually the same amount was reissued into circulation. As a result, a large mintage of new cents was not necessary. The reported mintage of 1877 Indian Head Cents for circulation is 852,500 pieces, with an estimated 900 proofs coins struck for collectors. This was a sharp drop from the previous year, when the Mint produced almost 8 million cents, and even greater decline from mintages of the 1860’s and earlier 1870’s. Despite the somewhat high mintage for a key date coin, the number of pieces that have survived to this day is much, much lower than the mintage suggests. In all grades, perhaps no more than 5,000 1877 Indian Head Cents are still known to exist, and perhaps only 10% of these are still in uncirculated condition. Proofs are more relatively available, with approximately two-thirds of the original mintage remaining, but these are highly valued as well, despite having a similar mintage to other proof coins of the series. 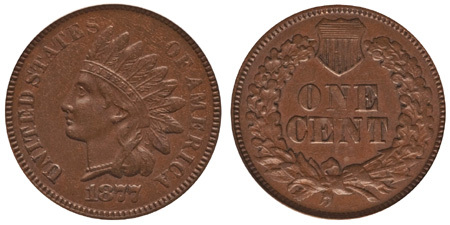 There are several possible explanations for the scarcity of the 1877 Indian Head Cent. The first is that all coins circulated extensively and were later melted. This, however, appears unlikely, as this issue has been known to collectors as rare since the late 19th century. Another possibility is that the mintage was incorrectly recorded, which is known to have occurred at the Philadelphia Mint from time to time. But perhaps the most likely reason is that the mintage did occur, but that not all were released into circulation (perhaps as few as 200,000) and that the others were later melted at the Mint and used for the production of other dates. It is also a mystery why only two die pairs are known to exist, when die life in this period was no more than a couple of hundreds of thousands of coins, and no coins are known to exist from excessively worn dies. The finest known circulation strikes with original red coloration by PCGS are six MS66RD’s, while NGC has graded no examples finer than MS65RD. Both PCGS & NGC have graded a few examples in MS66RB as well, along with a single NGC MS66BN. Regardless of the numerical grade all 1877 Indian Head Cents with original Mint red coloration showing are rare. The finest Proofs are graded PR67RD by both PCGS and NGC, while a few examples in lower grades have been certified with the cameo designation. These usually trade for lower values than the best Mint State examples. One of the finest known circulation strike examples graded PCGS MS66RD sold for $149,500 in 2007, while a coin of the same grade sold for that exact same amount in 2009. Highly desirable in all grades, even well-circulated examples command heavy premiums over other Indian Head Cents from the 1870s.